Do you see a difference between these two jackets? At the beginning of the winter season, Frank’s aunt purchased a jacket for Carlito from Land’s End ($70). A very nice jacket, perfect for his ski trips, daily use, sledding, etc. She got the jacket with matching hat and gloves – very nice, practical gift. He wore it thorough most of the season until the zipper broke, and we had to exchange it for another one. It was an easy exchange, I’ll give Land’s End credit for that. Twords the middle of winter, though, Sal’s jacket broke. He had been using a hand-me-down from Carlito, but that was too snug. Well, during one of my Goodwill trips, I found a duplicate of the jacket Carlito’s been wearing – in Sal’s size and in excellent condition – at a fraction of the cost ($7). I picked it up, checked the zipper, looked for tears… nothing. The only difference was the name label inside was cut out. I could definitely work with that. Score. 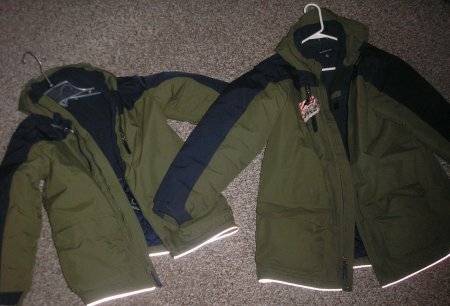 Sal’s jacket is the smaller, on the left; Carlito’s is on the right. I just love it when I can purchase bargains. Without that logo, these jackets are really identical. This is really a rare find considering that the first one was really pricey.